The season for late fall kings finally got going last week following the first significant storms of the year. For the Smith and Chetco, I’d say the fishing was fair. While there were some big, bright fish caught on both rivers, the overall scores were pretty underwhelming. Now granted, conditions weren’t exactly perfect, but we were all hoping to see a few more fish around. Especially bright ones. The one nice surprise was the number of jacks, or two-year old kings on the Smith. Their numbers far outweighed the adults, which is always a good sign for our future runs, but they don’t provide the smiles like a chrome bright king. Looking forward, off and on rain is in the forecast through Saturday, which should keep the Smith and Chetco at prime levels. The Humboldt rivers should also stabilize. The Mad, SF Eel, and the Van Duzen could all drop into fishable shape by Monday if the rainfall predictions are correct. With excellent river conditions on the horizon, we’ll have a real good idea by the end of the weekend if the heart of the run has already made their way upriver. If so, bring on the steelhead. “We don’t expect any huge rain events for the next week, but we do expect to see a few decent systems move through the area,” said Kathleen Zontos of Eureka’s National Weather Service. “The next system will arrive Wednesday night and will linger through Thursday, with the majority of the rainfall hitting the Eel basin. Rainfall totals will be from a half to an inch in the Eel basin and a half to three-quarters in the Smith area. Light showers are predicted for Friday, with the next system hitting overnight Friday and into Saturday. Up to an inch and half could fall in the Smith basin and up to an inch in the Eel basin. Sunday and Monday are looking like they’ll be dry. Another system is forecasted for Tuesday and Wednesday, but there’s some uncertainty around this one. If the system is right over us, we could see one to two inches. If it clips us, we may see a half-inch. We’ll have to wait and see. The weather pattern does look active at least through the second week of December as of now,” said Zontos. Anti-snagging fishing gear restrictions were lifted on Tuesday after significant rains reduced snagging risks, according to a news release issued by the Oregon Department of Fish and Wildlife. These restrictions, in place to allow angling for Chetco River fall chinook salmon, are meant to curb illegal snagging. 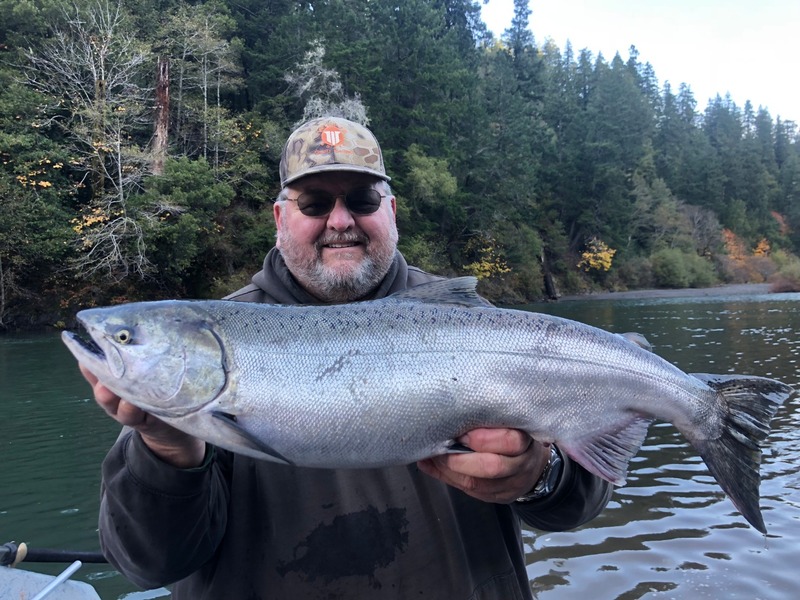 Fall chinook anglers on the Chetco and Winchuck have been relegated to fly-fishing or fishing with a bobber while using artificial lures or bait, with leaders no longer than 3 feet. On the Chetco, the rule applied to the top of tidewater at River Mile 2.2 to the mouth of Nook Creek. That rule typically is lifted after Nov. 4, when rains typically raise the river levels and allow the fish to move upstream. The rains did not arrive by then, so the ODFW extended the bobber rule through Dec. 31 or when rainfall allowed chinook to move upstream. The chinook bag limit on the Chetco is one per day and no more than five per year through December. The founders of Humboldt Steelhead Days, Mad River Alliance — in their 6th year of producing this annual wintertime event — announced this year’s fishing contest will occur on the Mad and Trinity Rivers and will again be limited to hatchery fish only. The three biggest hatchery fish on both rivers, caught and measured, from Jan. 19 to Feb. 23, 2019 will be eligible to win prizes and bragging rights. Anglers must register with a $10 donation in order to be entered into the contest. For more info and a complete list of events, visit www.humboldtsteelheaddays.com/. Salmon fishing took off on the Smith Thanksgiving Day following a decent storm that opened up the river to fishing. There were a few caught on Thursday, but Friday was tougher as the river was on the rise. Saturday, the conditions were excellent and the fishing was good for most of the boats. Some nice fish were caught, along with quite a few jacks. By Sunday, the river was low and clear and the scores dropped. Tuesday night’s rain brought in some bright fish to the tidewater according to Mike Coopman of Mike Coopman’s Guide Service. “With more rain in the forecast, the river should be in excellent condition through the weekend. Hopefully we’ll see a bunch of fish come in,” added Coopman. The Elk and Sixes both blew out on Tuesday but will be dropping into prime shape this week according to Martin. “Rain could blow the Sixes out again before the weekend. The bulk of the Elk River salmon run is expected in the coming days, but the river likely will be crowded. ODFW is radio-tagging several dozen kings for a study this fall. Any of the fish with radio tags, indicated by a hole punched onto their gillplate, must be released,” said Martin. Forecasted to be hovering right at 7 feet by early Monday morning. If the predictions are correct, if could be fishable by Monday or Tuesday. Flows are predicted to peak at just over 8,000 cfs on the Scotia gauge on Friday afternoon, but it’s predicted to drop to 5,000 cfs by early Monday morning. A long shot to be fishable before the next storm hits. The Miranda area is forecasted to peak at 3,300 cfs Thursday evening. Flows should be back down to 1,100 cfs by early Monday morning. Should be worth a look. Forecasted to hit 1,330 cfs on Saturday, but should be on the drop the rest of the day and Sunday. Flows are predicted to be under 500 cfs by Monday morning. There’s a chance it could fish above Yager Creek. 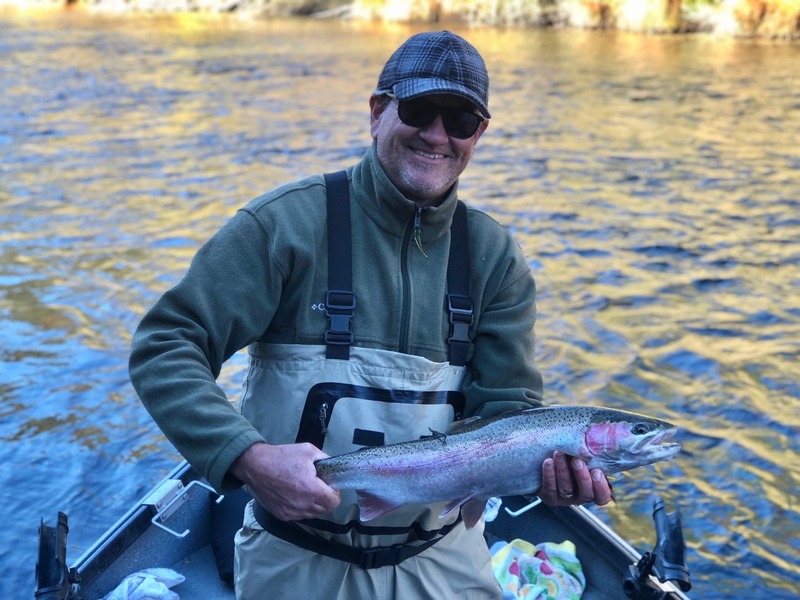 With more rain in the forecast, we should see a good week of fresh steelhead moving into the upper Trinity,” said Steve Huber of Steve Huber’s Guide Service. “Warmer conditions should help improve the bite, and all methods should be effective. The river was back on the drop Tuesday night. It looks like we may have some snow next week, so I expect conditions will be a little tougher, but we should have some more fish to work with,” added Huber.